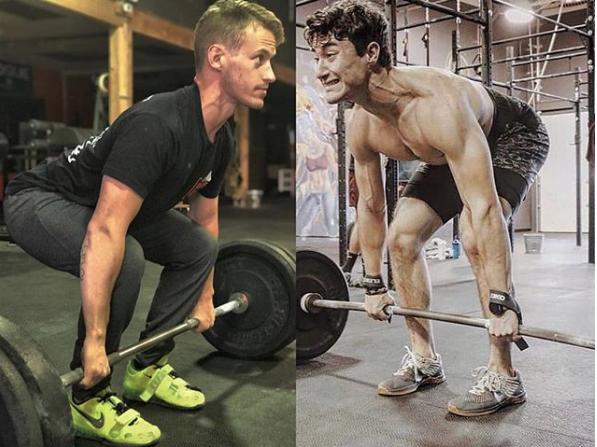 The Clean grip deadlift should look the same as the Clean. The end goal of the clean is to get the bar from the ground to the shoulders. An athletes starting position is imperative to a completed lift. From this starting position we need to get more leg drive in the initial push off the ground. This will put the hips in a lower position in the set up than in the deadlift, making it more quad dominant. Another key difference in the set up is that more weight will be in the toes (remaining flat footed), this will allow for that strong push from the legs and help maintain the angle of the hip and shoulders to the knee. In the deadlift the goal is to get max weight from the ground to the hip. In this start position the athlete will begin with a higher hip. Since the pull is only to the hip, the hip-chest angle doesn’t need to be as great as it does in the clean/clean grip deadlift. Instead the athlete can sit back further in our heels and drive the chest vertically and open the hips faster as the bar is pulled off the ground.